For close to 20 years I have been training dogs. My training adventures have taken me all over the world as I have trained security dogs for an inter-nationally recognized clientele. 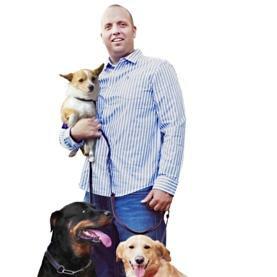 I have trained dogs for NBA, NFL, WWE, and WPGA athletes, politicians, CEO’s, entertainers and more. I have worked with this clientele in 18 states nationwide and in 6 countries world wide. My widely read dog training articles are currently published in dozens of internet dog training sites and in dog training publications and my video and audio dog training program has been used by thousands of dog owners all over the world. Throughout my dog training adventures I have learned many things. All dogs have unique personalities but there is one thing about dogs that is the same. All dogs ‘speak’ the same language. If you as a dog owner can learn to speak the language of your dog you will be able to train your dog to accomplish just about anything. I currently live in Salt Lake City, Utah with my wife, Vanessa, and our four daughters. What began as a fun pursuit as a teenager has blossomed into a wide ranging career that has taken me around the world and provided many adventures. I’ll forever be grateful for man’s best friend.